Adrian Karatnycky, senior fellow at the Atlantic Council, has written a good article, titled "Warlords and armed groups threaten Ukraine’s rebuilding", in which he discusses important issues related to today's Ukraine. In March this year, I wrote that the newly-elected (then acting) government had to "urgently address two most important problems: the military Russian invasion that [had] already started in the Crimea, the southernmost region of Ukraine, and the dire economic situation". Writing at the end of this year, Karatnycky argues that Ukraine's established government is relatively successfully dealing with these two problems: "Ukraine is intelligently addressing its key challenges: restructuring the national budget to avoid default and meeting the military threat posed by Russia". At the same time, Karatnycky highlights another problem, namely "independently operating warlords and armed groups", some of which are guided by far right ideology, as well as the cooperation between these groups and Ukraine's Minister of Interior Arsen Avakov - the cooperation that I have briefly discussed here. However, there is one inaccurate passage in Karatnicky's article, where he writes about "the notorious Azov brigade, whose members had been shunned during the Maidan protests because of their white-supremacist, anti-democratic views". The truth is that the Patriot of Ukraine, a neo-Nazi organisation that formed the core of the Azov volunteer battalion in May 2014, was never "shunned during the Maidan protests". For example, members of the Patriot of Ukraine (or Social-National Assembly that is yet another name for the Patriot of Ukraine) were taking an active part in the confrontation by the Presidential Administration on Bankova Street on 1 December 2013. 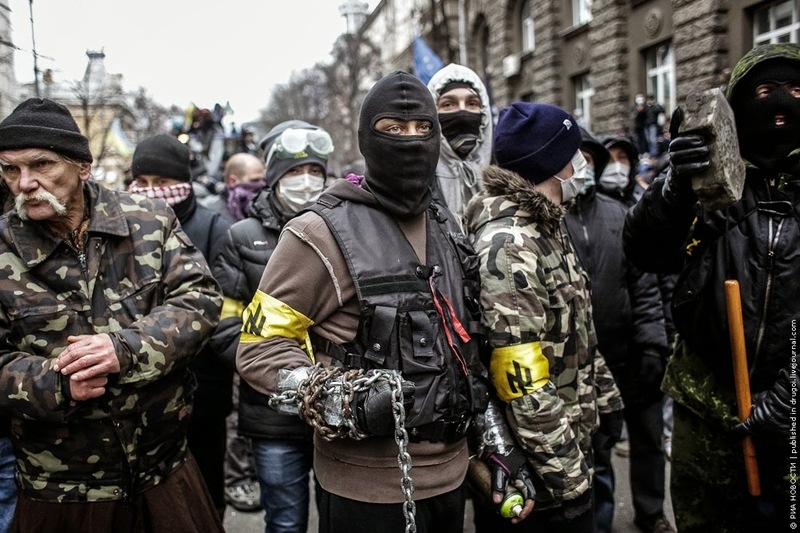 During the revolution, some members of the Patriot of Ukraine were part of the Right Sector, while some others preferred to cooperate with C14, a neo-Nazi organisation that was then associated with the far right Svoboda party. (In his interview with BBC, the leader of C14 Yevhen Karas claimed that they were fighting against particular ethnic groups, Russians, Jews, Poles). However, apart from Oleh Odnorozhenko, the ideologue of the Patriot of Ukraine, none of its leaders took part in the revolution, because all of them had been imprisoned since 2011. The leader of the Patriot of Ukraine, Andriy Bilets'ky, was charged with an attempt to commit murder. All the leaders of the Patriot of Ukraine were released on 24-25 February 2014 at the initiative of MP Oleh Lyashko who put forward a resolution giving a number of jailed or convicted individuals a status of "political prisoners". Lyashko would later use the leaders of the Patriot of Ukraine for his PR campaign, but they parted ways afterwards. To reiterate: while the leaders of the Patriot of Ukraine were imprisoned during the revolution, its rank and file did take part in it, although they constituted a minor element of the whole far right movement that, in its turn, constituted a minor element of the revolution itself. When I asked Adrian Karatnycky what he meant by saying that members of the Patriot of Ukraine "had been shunned during the Maidan protests", he replied that his source was Andriy Parubiy. During the revolution, Parubiy was a coordinator of the volunteer security corps for the mainstream protesters. Since he was also coordinating the relations between the mainstream protests and the Right Sector, he simply could not have been unaware of the fact that the activists of the Patriot of Ukraine had been taking part in the revolution. If he indeed said that they "had been shunned during the Maidan protests", then he obviously lied. The question, however, is why take his words at face value, without taking into consideration the existing research on the participation of the far right in the revolution? Russia and the US are two centres of mondialism that essentially aspire to destroy the European spirit as antagonistic to their nature. Aspire to destroy the identity of the European nations. Yet they do not understand: barbarians may temporarily win, may destroy many things, but they will not destroy the European spirit, the spirit of the white race. Barbarians come and go, but Europe remains; Europe as the centre of the world spirituality and civilisation, Europe of the free nations. For fairness' sake it should be said, that Parubiy has distanced from the SNPU/Svoboda already in 2004; he has refrained from using racist rhetoric ever since and seemed to have reformed himself into a mainstream national-democratic politician. This makes his lies about the involvement of the Patriot of Ukraine in the revolution even more unfortunate. UPDATE: Adrian Karantnycky's article does mention that members of the Patriot of Ukraine (later Azov) took part in the revolution. He also clarified that Parubiy, when saying that the Patriot of Ukraine "had been shunned during the Maidan protests", referred only to his mainstream security units (called Samooborona) that allegedly shunned the Patriot of Ukraine. However, the Right Sector, which featured members of the Patriot of Ukraine, was the 23rd "hundred" (sotnya) of Parubiy's Samooborona, and it was Parubiy himself who allocated the 5th floor of the Trade Union building to the Right Sector. I am fascinated by your detailed info about fascism, whether of the Ukrainian or Russian variety. My take is that the fact that they oppose each other, while having so much in common such as hatred of the US, must come down to the fact that Nazism was at its root National Socialism, so the national dimension is paramount. The traditional historical enemy would have been International Socialism i.e. Lenin and Trotsky's Bolshevism and the purported international Jewish Conspiracy. That traditional enemy seems to have morphed into global capitalism in the fascist worldview. This sheds light on why Syrizia and Anel can make common cause and Syrizia can cozy up to the Russian foreign policy. But it is a topsy turvy world of political syncretism where a buffet table of ideas invite everyone to 'make their own tasting plate'. For example, we see Tsipras ostentatious refusal of the Greek Orthodox Church's blessing, while he embraces Greece's traditional Orthodox ally of Russia. (...)The truth is that the Patriot of Ukraine, a neo-Nazi organisation(...) - thank you for telling the thruth!